Preah Sihanouk or Sihanouk Ville is the famous tourist place of Cambodia. It is called Kampong Som. The province is located far from Phnom Penh more than 200 km to the southwest. There are many islands in this area where visitors may have the great beach time in their holiday in Cambodia. Tourist Islands: There are the main islands for tourists such as Koh Rong located to the west of the city; Koh Rong Samloem located to the south of the city and Koh Tang located far from city more than two islands above. Climate: Sihanouk Ville has its warm and humid climate. It is suitable for travelling through all the year. The average temperature is 24 to 27 C degree. Deum Chhrey Beach: The beach is not far from the center city. This is one of the famous places for tourists who come to swim and take the photographs because there are many statues in the park nearby. Kbal Chhay Waterfall: the waterfall is located far from city center more than 15 km to the north. This is one of the attractive places for tourists to explore to enjoy the great natural feature of the city. Koh Pors: the wild and quiet island that located far from Lomhe Kay Beach about 1 km. The island is the ideal place for tourists who love the calm of the beach space. 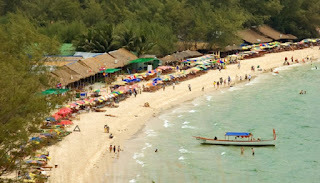 Koh Rong Island: Koh Rong is the largest island in Sihanouk Ville. It is far from the city more than 40 km. It is called the paradise for beach time in Sihanouk Ville. 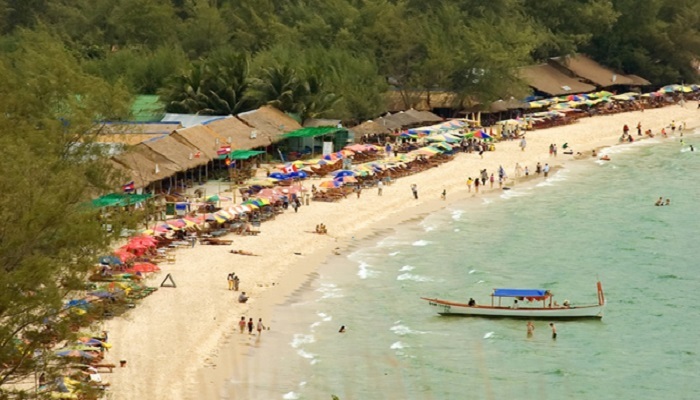 Ochheuteal Beach: one of the most popular beaches in Sihanouk Ville. The beach is located in the north of the city. It is opened from 1990s. Now there are many hotels, restaurants and bungalow here to serve the perfect beach time for tourists. Otres Beach: the great beach is newer than Ochheuteal Beach. Otres Beach is located next to Ochheutela Beach to the south. This has been in the top of 22 beaches in Asia by Forbes. Wat Krom: the historical site with unique architectural in Sihanouk Ville. It is locate not far from city center. It is about 3 km from the center and takes you just some minutes to come here. Wat Leu: it is considered one of the significant in the architecture of Sihanouk Ville. It is also the important place for understanding a little bit about the city in the religion. The site is located far from the city center more than 5 km. 3 Meak Bochea Day: the event is happened in February of the year. Visak Bochea Day: the event is happened in May of the year. Khmer New Year: it is happened from 13 April to 16 April in Sihanouk Ville and all provinces in Cambodia. Pchum Ben Holiday: it is happened in October of the year. Commemoration Day for King Sihanouk: it is happened in October of the year. Water Festival: it is happened in November of the year. There are different local specialties in the city especially seafood and Khmer food. Beside you can find here the European or Mexican cuisine that served in some famous restaurants along the beaches or in the city’s center.